If you’re into fashion and like to look on top form – no matter what the occasion – Mainline Menswear is here to cater for all of your wardrobe needs. With an epic offering of designer wear, since 2004, Mainline Menswear has been bringing excellence to the masses in both product and service. With hundreds of satisfied customers scouring their comprehensive ranges on the regular, for men of all styles and budgets – Mainline Menswear has got the key to a truly enjoyable shopping experience. To jazz up both your weekday and weekend gear - you can trust in Mainline Menswear. Their footwear collection is frequently updated with truly dapper additions – here you’ll find the coolest trends in trainers and more from top brands. Now you know that you’ll stand out from the crowd, especially when you can shop new arrivals. You’ll get the latest releases here first, from your favourite designers like Converse, Adidas, Nike and more. It doesn’t stop at trainers though as shoes aren’t old news with Mainline Menswear. For your brogues, boots and more, now you can add depth to your wardrobe - whatever the season. Plus, with Mainline Menswear you can be certain that the quality of the materials used will be unfaultable, and when it comes to the designs - ditto. Think classic wingtip panelling, slim lace fastenings, soft suedes and leathers – you and your soles really are in for a treat. Visit the Mainline Menswear page on vouchercloud and click to ‘View Deal’ on the offer of your choice. We will apply the savings automatically, then you can click through to the website. Browse through their offerings and add the items you'd like to your basket. Once you’re ready to checkout, scroll over your basket in the top right-hand corner and click ‘Checkout’. Your savings will have been applied to the item total, you can then choose your preferred method of payment to complete your purchase. Sign up to the Mainline Menswear newsletter to stay ahead of the game and find out about any exclusive offers. You have 14 days from when you receive your delivery to ask for a refund or exchange should you be unhappy with your products. Do check their policies for more information. You can also fill in their online form if you prefer. Mainline Menswear is the best place to go if you’re looking to update your wardrobe with a few fresh designer essentials. Whether you’re after a new pair of jeans or a crisp shirt, you’ll be sure to find a fantastic selection of items at Mainline Menswear. Shop with a Mainline Menswear discount code and save more money when you next buy online. You can filter through their offering by brands, clothing and footwear; you could even let yourself be inspired by their bestsellers and what’s new. Find a huge range from the most renowned brands of the fashion world including Diesel, Hugo Boss and Ralph Lauren. They are pros in clean cut clothing and exquisite design; from chinos, to accessories like rucksacks and belts – your look will come together seamlessly. With a Mainline Menswear voucher code from vouchercloud, you’ll be sure to make savings on your purchases. 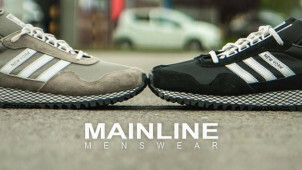 Now you can up your game today with brands from Mainline Menswear.